Nicholas Flamel appeared in J.K. Rowling’s Harry Potter—but did you know he really lived? And he might still be alive today! 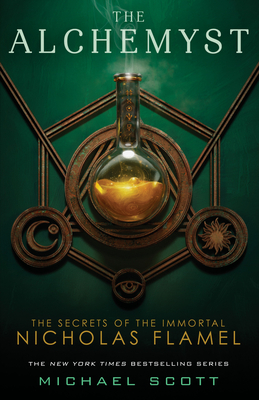 Discover the truth in Michael Scott’s New York Times bestselling series the Secrets of the Immortal Nicholas Flamel with The Alchemyst, book one. The truth: Nicholas Flamel was born in Paris on September 28, 1330. The legend: Nicholas Flamel discovered the secret of eternal life. Nicholas Flamel lives. But only because he has been making the elixir of life for centuries. The secret of eternal life is hidden within the book he protects—the Book of Abraham the Mage. It's the most powerful book that has ever existed. In the wrong hands, it will destroy the world. That's exactly what Dr. John Dee plans to do when he steals it. Humankind won't know what's happening until it's too late. And if the prophecy is right, Sophie and Josh Newman are the only ones with the power to save the world as we know it. Sometimes legends are true. And Sophie and Josh Newman are about to find themselves in the middle of the greatest legend of all time. Michael Scott is the New York Times bestselling author of The Secrets of the Immortal Nicholas Flamel series, an authority on mythology and folklore, and one of Ireland’s most successful authors. A master of fantasy, science fiction, horror, and folklore, Michael has been hailed by the Irish Times as “the King of Fantasy in these isles.” The Alchemyst is the first book in the Nicholas Flamel series. Look for book two, The Magician; book three, The Sorceress; book four, The Necromancer; book five, The Warlock; and book six, The Enchantress, all available from Delacorte Press. You can follow Michael Scott on Twitter @flamelauthor and visit him at DillonScott.com.